Drake reportedly spent over £500 at Nando’s after his recent show in Leeds, treating his tour crew to plenty of chicken. The ‘One Dance’ singer performed at the First Direct Arena on Thursday 9th February, before heading into the Briggate branch at 10.30pm for a cheeky meal. 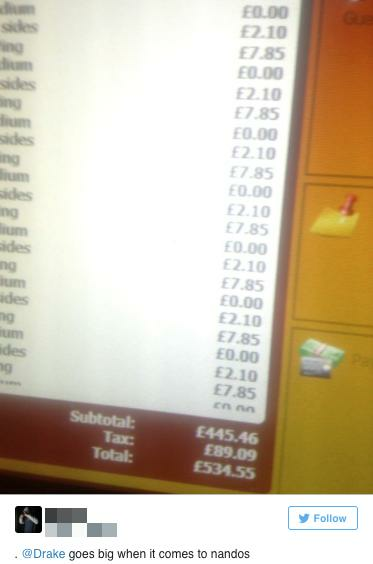 According to a member of staff at the shop, Drizzy ordered £534.55 worth of chicken and sides! According to The Daily Mail, Drake got 320 medium wings, 120 Lemon & Herb wings, 25 medium chicken wraps, 25 plain chicken wraps and eight medium 1/2 chickens. And on the side, he ordered 10 portions of spicy rice, five portions of chargrilled vegetables, 10 pieces of garlic bread and two portions of chips. The huge request led to delays at the Nando’s as fans had to wait for Drake’s order to be finished. Even Nando’s saw the funny side. Meanwhile, Drake is still on his European The Boy Meets World tour, with the rapper set to release his new playlist project “within the next two weeks”.